How is the Orifice Setting Used in SWMM 5 RTC Rules?by dickinsonreSubject: How is the Orifice Setting Used in SWMM 5 RTC Rules? The Real Time Control Rule for Orifice Setting can be a function of a Setting constant, Setting from a Curve, Setting from a PID controller and a Setting from a Time Series (Figure 1). The Setting affects the Full Depth of the Orifice at each time step. The setting which ranges from 0 to 1 can either completely close or open theorifice (Figure 2). You will have to use the equivalent in ICM or else the settings derived from the SWMM 5 time series need to be multiplied by the orifice depth to have the same effect in ICM that it had in SWMM 5. Figure 1. The Possibilities for defining the Setting of an Orifice in SWMM 5 from a H2OMAP SWMM RTC dialog. For making one or more of your pumps inactive you just need to use the Facility Manager and make the pumps inactive (the grey lines in Figure 2). The other method of making the gravity mains have a really small diameter will not work as the flow is pushed through anyway and the value of q/Q full is very high. One way to do what you want to do is to use a Flow Split and make the flow in the blocked link very small as a fraction of the incoming flow. You will need to add a new link and out fall to handle the excess flow from the pipe blockage (Figure 1). InfoSWMM Version 12 Revs Up Modeling Performance With HEC-22 and 64-Bit Support Latest Software Release Supports Faster Time to Design and Lower Analysis Costs Broomfield, Colorado USA, July 25, 2012 — In its ongoing quest to equip the wastewater industry with the world’s most comprehensive and innovative smart network modeling and management solutions, Innovyze, a leading global innovator of business analytics software and technologies for wet infrastructure, today announced the worldwide availability of the V12 Generation of its industry-leading InfoSWMM for ArcGIS (Esri, Redlands, CA). 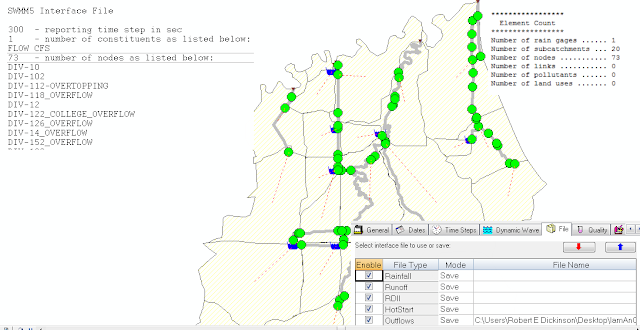 InfoSWMM V12 enables engineers to work more efficiently and reliably with very large and complex network models, thanks to improvements in such areas as HEC-22 inlet support, built-in 64-bit simulation, enhanced water quality modeling, and batch run scenario management that will positively impact modeling teams each and every day. How Does a TYPE3 Variable Speed Pump Work in SWMM 5? Subject:How Does a TYPE3 Variable Speed Pump Work in SWMM 5? In a SWMM 5 Type3 pump the flow is a function of the head difference between the downstream node head and the upstream node head (Figure 2) but the pump rules can be overwritten by a RTC Rule as in the attached example. 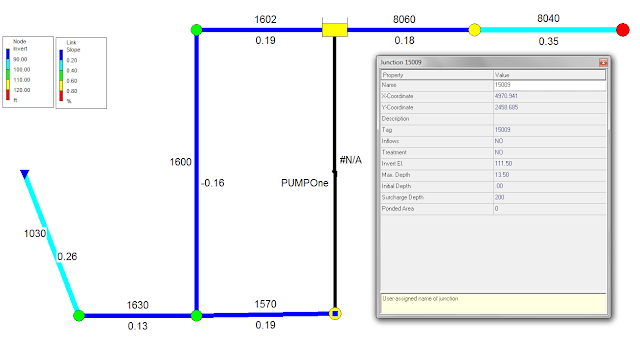 The RTC Controls in the example change the pump setting as a function of the depth in the Wet Well. There is one pump between the Wet Well and Force Main but the Pump Setting varies from the RTC rules based on the depth in the Wet Well (Figure 1). As you can see in the composite Figure 2, the setting varies from 0, 1, 2 and 3 during the course of the simulation. How Does a TYPE3 Pump Work in SWMM 5? Subject: How Does a TYPE3 Pump Work in SWMM 5? A SWMM 5 Type3 pump flow is a function of the head difference between the downstream node head and the upstream node head (Figure 1) but the pump rules can be overwritten by a RTC Rule as in the attached example in which the pump is only turned on then the flow in the upstream link 8040 is greater than 25 cfs. 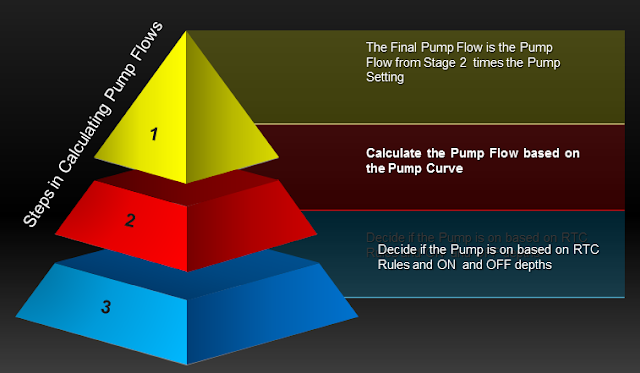 Important components of the TYPE3 pump are: Surcharged Nodes to connect the Force Mains to the Pump (Figure 1), Force Mains (Figure 2), Wet Wells (Figure 3) and the TYPE three Pump Curve and the On and Off DEPTHs of the Pump (Figure 4). How Does a TYPE2 Pump Work in SWMM 5? Subject: How Does a TYPE2 Pump Work in SWMM 5? 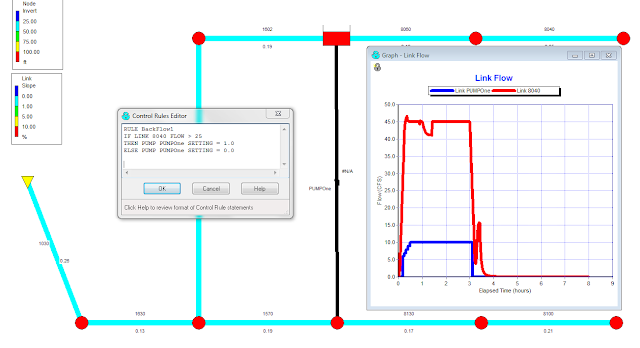 A SWMM 5 Type2 pump flow is a function of the depth at the upstream node (Figure 1) but the pump rules can be overwritten by a RTC Rule as in the attached example in which the pump is only turned on then the flow in the upstream link 8040 is greater than 25 cfs. Subject: How Does a TYPE1 Pump Work in SWMM 5? Subject: What are the Types of Force Mains (FM) in SWMM 5? What are the Types of Force Mains (FM) in SWMM 5?by dickinsonreSubject:What are the Types of Force Mains (FM) in SWMM 5? NPR - How Good Were Climate Models 30 Years Ago?